I have found myself recommending the Airwave to a score of warm weather riders over the past year without hesitation. The Airwave offers Rev’it!’s lauded quality and precision fit at an entry level price point. Combine that with the refined, subtle, modern design sense of the Netherlands and what you have is the very definition of the term “bang for the buck”. Not to mention that, due to the large mesh panels, the Airwave is not just “cool”, it is very good at keeping you cool. The new version of the REV'IT! Airwave 2 Jacket and Pants feature some major styling changes, while keeping the large mesh panels that define the Airwave. Functionally, this jacket will perform just like it’s predecessor, but if you think this is just a matter of changing the wallpaper you’d only be mostly right. This is because in select colors there is actually a printed diamond pattern reminiscent of a chain link fence printed on the shoulders and the outside edge of the sleeve. That’s easily worth 2-3 horsepower in my book. The REV'IT! 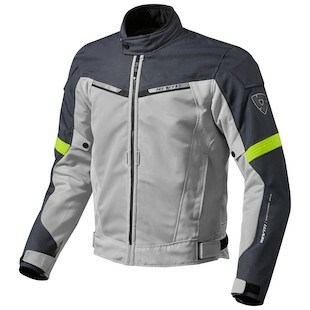 Airwave 2 Women's Jacket is also available for female riders. The major upgrade to the REV'IT! Airwave 2 Pants comes in the form of a redesign of the mesh paneling, which removes the “rock climbing harness” look, which made its predecessor so distinctive. Obviously that is a miss. It is also worth noting that the full zip has been replaced by one that stops below the knee, so we can no longer consider this a true overpant. That said, wearing a second pair of pants under a mesh riding pant is negates the purpose. As with the Airwave 2 Jacket, the REV'IT! 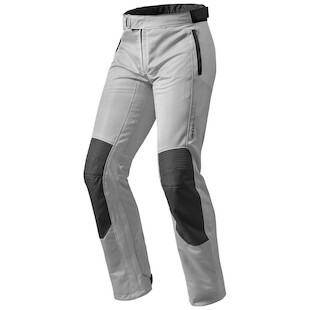 Airwave 2 Pants provide female riders with a specifically designed option that has a more feminine cut. Overall, this simple redesign has left everything I love about the Airwave in tact and, as such, I cannot recommend it enough for enjoying all the awe-inspiring roads available in otherwise too hot to ride climates.